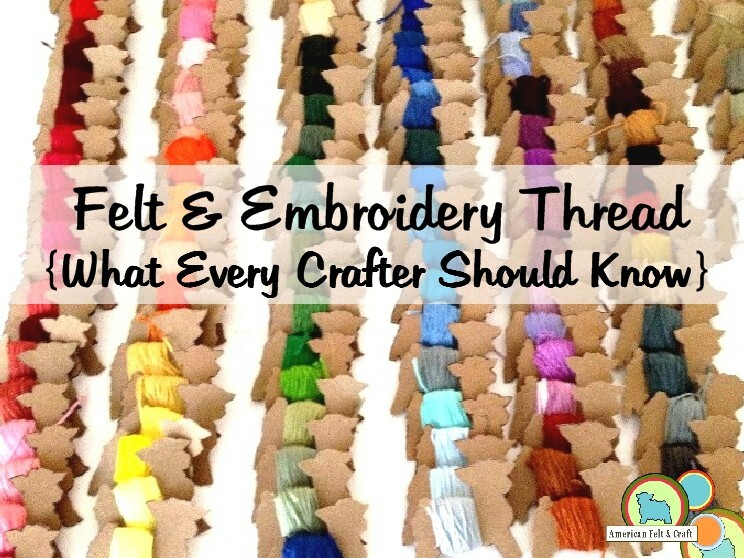 If you are new to the world of felt crafting you may have noticed that cross stitching or thread embroidery seems to be the go to choice for most felt crafters. And it’s no wonder – Skeins of cross stitching thread are readily available in a million color choices are inexpensive and are easy to store and transport. How easy is it to store? How about over 100 colors in the space of 3″ easy? More on that below. One of the best things about working with felt is its wide range of colors and ease of use in smaller projects and detail work. But all those small scraps of color can add up to a lot of thread. The cost of embroidery or cross stitching thread can be as much as 80% cheaper than traditional thread spools. 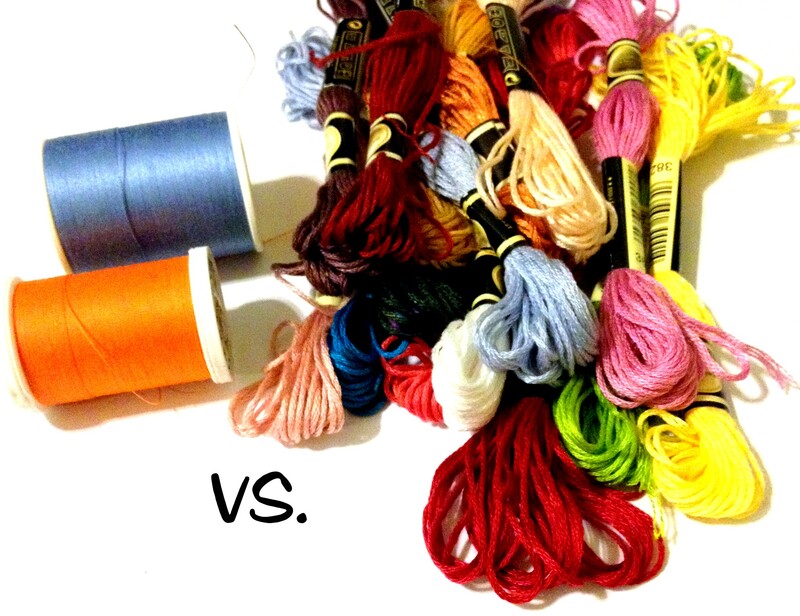 (Translated: 16 skeins of cross stitching thread vs. 2 spools of standard thread.) 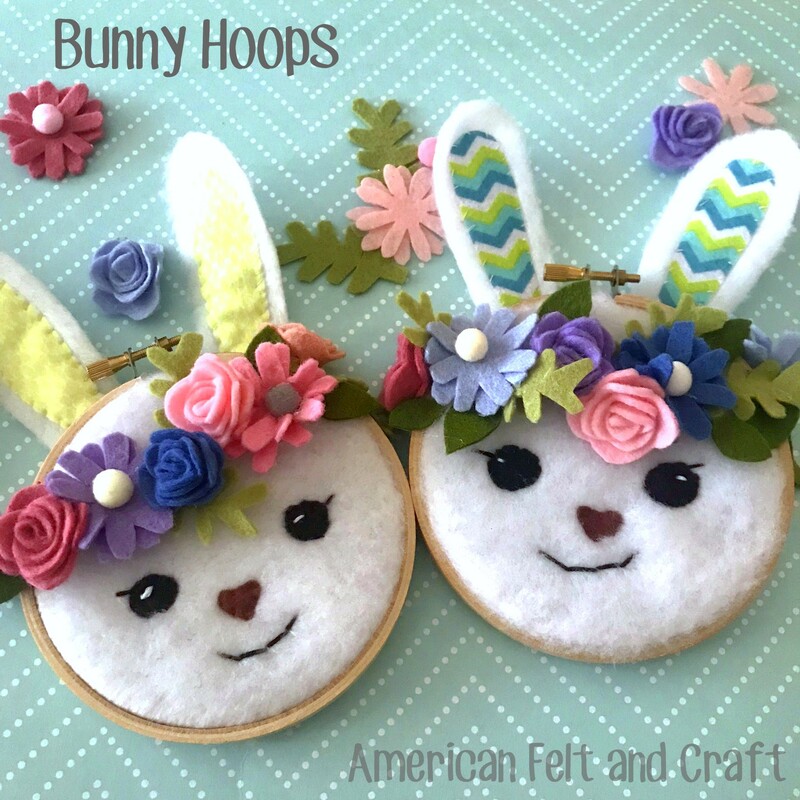 You may also find yourself working with shades of felt you don’t use often or sewing very small details and don’t see a need to invest in a larger spool to sew. Traditional spools of thread are round and have a tendency to roll around which, while helpful on a sewing machine is quite annoying when hand crafting. Bobbins lie flat and just beg to be thrown into a project baggie for crafting on the go. Cross stitching thread is has very little sheen or shine to it making it blend easily into dense felt. The cotton in embroidery thread isn’t as strong as the typical spool threads but this generally doesn’t present a problem. Cross Stitching or embroidery thread is easy to find. Many big box stores now only carry a few shades of thread but will still carry dozens of shades of embroidery thread. Since most felt work is hand sewn the aggravation of separating the threads in exchange for a wide selection of easy to locate, portable, space-saving, inexpensive colors seems a small price to pay. Different thicknesses of embroidery or cross stitch thread used in running stitches and french knots on felt. #25 cotton embroidery floss is the most commonly sold type, it comes in six strands of thread twisted into one thick strand. Most sewing projects are done with just 1 or 2 threads separated from the bunch after cutting it to the desired length. Occasionally you will want a thicker thread for a tighter hold, visible stitching or filling in details. 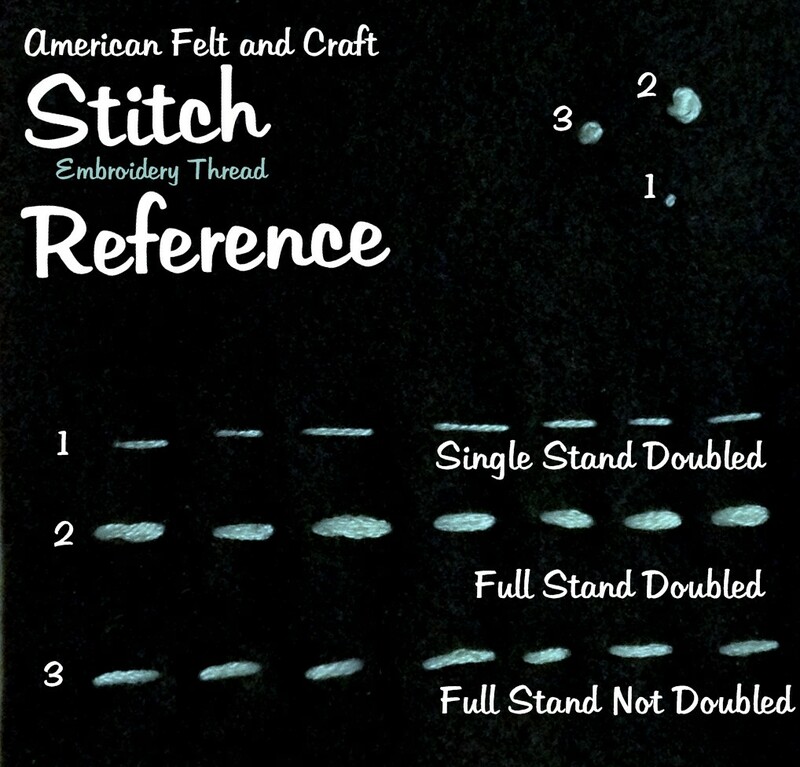 Click HERE for more on stitches and their uses. For larger products or often used colors standard spool threads are still a better bet because all that untangling of thread can be really time-consuming. 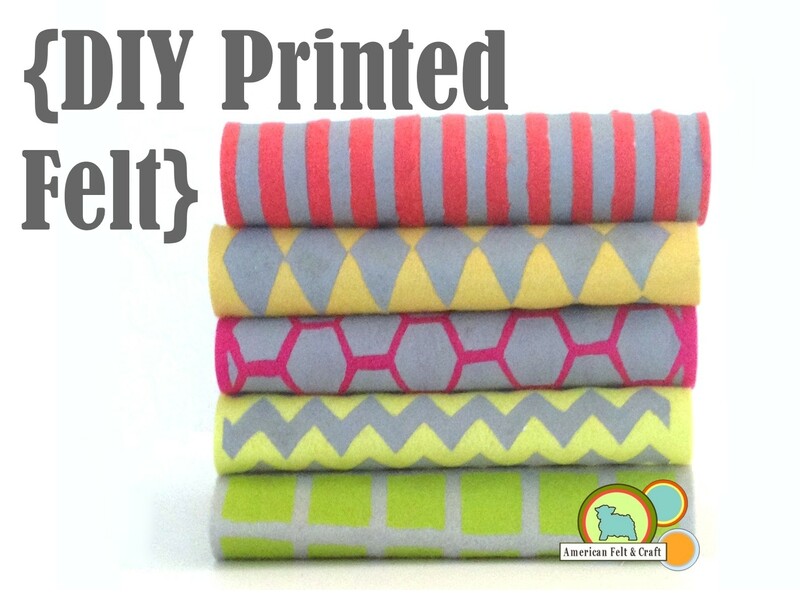 Play around with the thicknesses and stitch styles for added detail on any project. 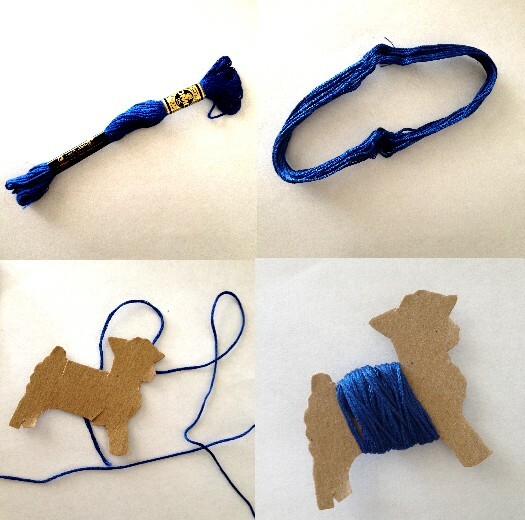 Embroidery floss is also available in silk, linen, glittered, metallic and even glow in the dark! How to store embroidery thread. Now that I’ve helped you justify your purchase of 85 skeins of embroidery thread let me give you a word of warning, this whole project can go south if you don’t move that thread to bobbins ASAP. Your 8th grade jewelry box has nothing on the tangled rainbow hell that awaits those who don’t heed my warning. Slip one cuff off at a time taking care not to distort or twist the thread too much. Keep the thread in its circle and look for the shortest thread along the top. It should come apart smoothly. 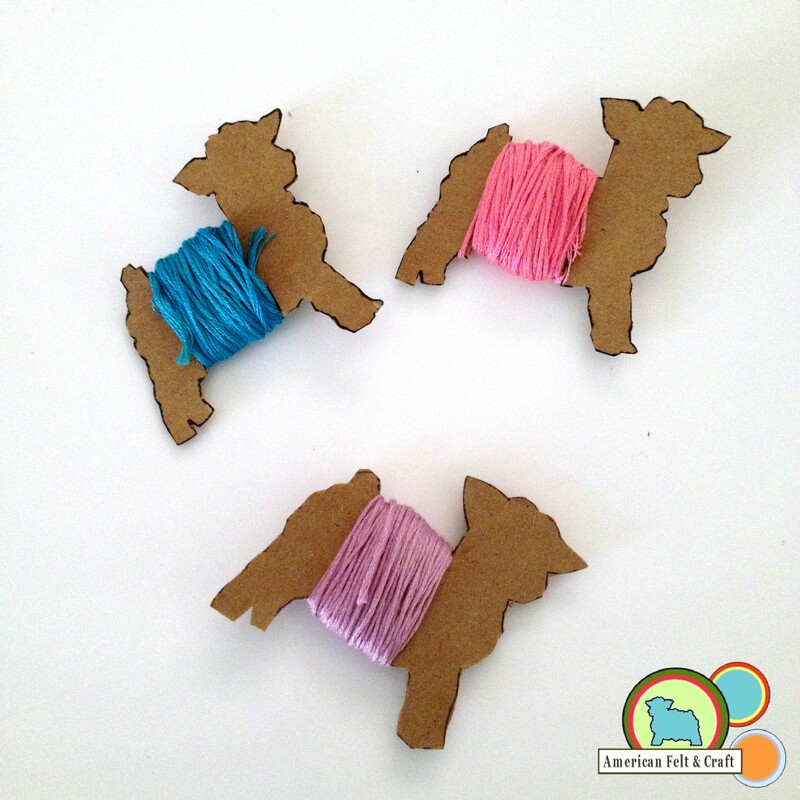 Rein in your threads Bo Peep style with these free printable felt sheep bobbins. That’s all well and good but how do you store sheep shaped bobbins you ask. How to store Thread Bobbins. I store my sheep in a 3″ binder inside deep pocketed pocket pages and I always know where to find them. One of my favorite things about storing the thread bobbins this way is that they are easy to flip through and hold samples against for the best color matches possible. When buying pocket pages look for deep pockets to help keep your sheep in line, since they will start to slip put if your binder is held upside down. While winding your bobbins try to make your sheep bellies even and flat so they don’t slip out of the pages as easily. 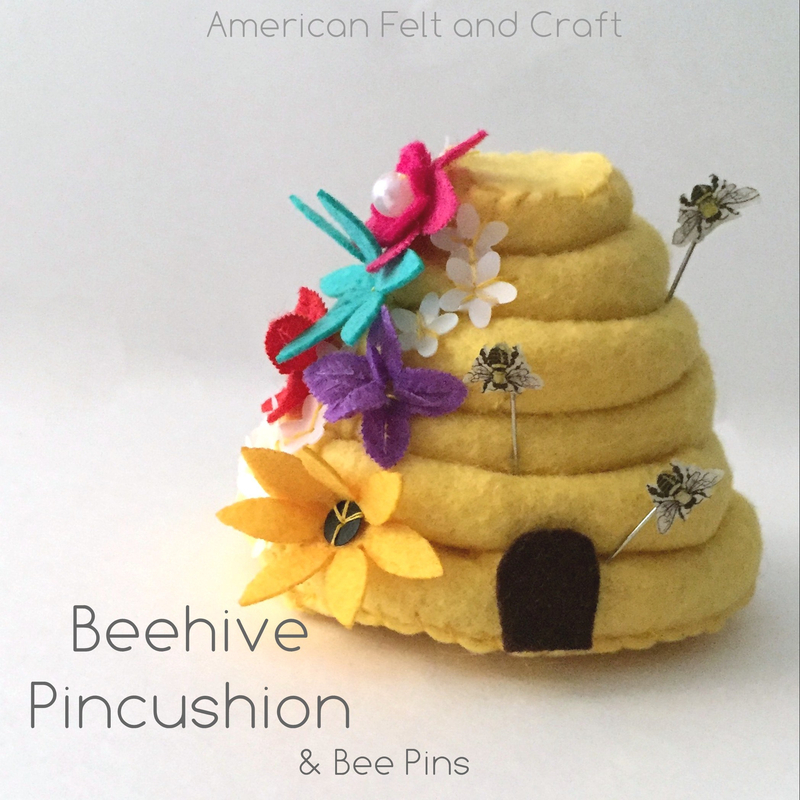 Tags: bobbin, craft storage, cross stitching thread, embroidery thread, felt, Felt craft thread, sewing felt, sewing felt tips, storage, store, thread for felt, tutorial, what kind of thread to use for felt, what kind of thread. 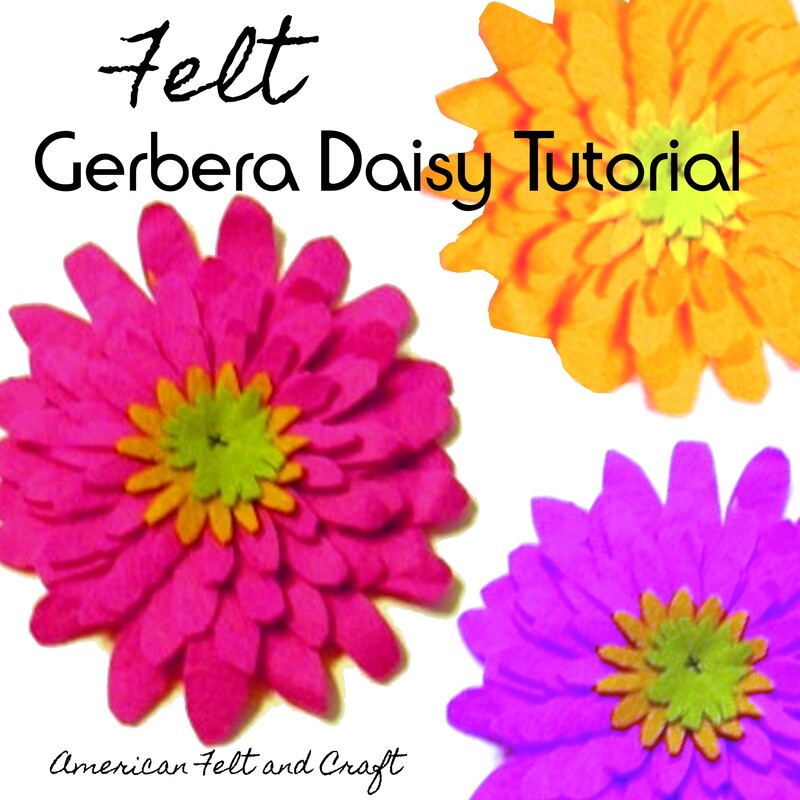 Felt food 101- How to make Felt Food lesson 5 Stuff it! 3 years ago I was put on bed rest during a pregnancy it was also around this time that I spent my daughters college fund on a beautiful pink retro kitchen set, I think you know which one I am talking about, you know the one everyone passes and says, “who would pay that! ?” well I did, anyway for Christmas that year along with her lovely kitchen she received some wooden play foods, which being very little she promptly used to scratch and dent her wonderful kitchen…needless to say those little suckers were gracing the shelves of goodwill by weeks end! But what can you do in a play kitchen without play food, and I wasn’t about to bring a bunch of plastic junk into my home, then the solution presented itself in the form of felt food. I have now made everything from soup to nuts, literally. 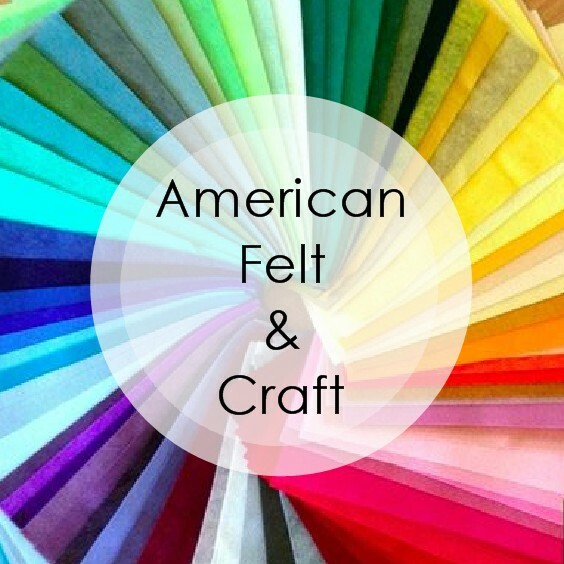 After crafting felt food for sometime I began to get frustrated trying to find the bits and pieces of everything I needed to do what I wanted to, so together I decided to create the store I was looking for, American Felt and Craft. Please stop in sometime and take a look around. And as always if you have any questions I am just an email away and I’m happy to share my knowledge and a few of my favorite patterns with you! In this the last installment of Felt Food 101 I’ll be convering the subject of stuffing your creations. If you just doing some bare bones construction all you will need is stuffing any kind from any place, I have even been known to head to tag sales for stuffed animals to butcher for this exact purpose, the bonus to this is that your saving a huge, and generally ugly stuffed animal from rotting in a landfill, this is especially important because fiberfill is a plastic. While it does eventually break down it’s chemical components soak into the ground and can get into the ground water so any you can salvage for a higher purpose is great. I usually buy my giant stuffies for about 2 bucks sometimes less. I send them through the wash with bleach two times and then they are ready to go. However with the advent of bed bug outbreaks all over the country I’d hold off on this technique unless you know the stuffie. If your stuffie is too big for your machine unstuff it and place stuffing into pillow cases knot at the top and run through the washer. Please be forewarned if you’re not careful one of your children will inevitably fall in love with said animal it will grace your living room for the next few years! SO HIDE YOUR STOCK IN THE GARAGE!!! Of course you can always buy your stuffing. If your buying fiberfill I would recommend going with a mid-range to high priced bag the cheapest stuff has very short fibers which fly everywhere and are really irritating to your nose, eyes and lungs, and I hate the thought of that stuff creeping out into little lungs. You may also want to beware buying the super cheap stuff often marketed as premium quality fiberfill, it’s grayish in color, I have heard of peoples’ projects becoming permanently stained by this stuff, since the blueish strands are apparently not color fast. Your other last stuffing option is wool. I have begun stuffing with wool and it is so much nicer and really not much more expensive than the plastic fiberfill stuff. And because wool has antibacterial and antimicrobial properties I feel better about giving it to my kids. You can buy wool stuffing at our store. Or through various local and online vendors. Another thing I have noticed about wool is that is seems to have a much larger loft than plastic stuffing so you get more puff for your buck. When using stuffing to make felt food there is one golden rule it is always better to under stuff than to over stuff. over stuffing results in bulges and puts alot of stress on your seams. Over stuffing also results in hard felt food which isn’t nearly as love able. If you’re getting really into the whole felt food thing you’ll soon learn that there are many applications where plain old stuffing just won’t do, and you may want to invest into different stuffing methods like foam and batting. Batting stuffs just like stuffing only it lays flat and stays that way so it’s perfect for making flat low items like pizzas, cookies, and slices of bread. You use it just like stuffing only you cut out the size and shape piece you need and slip it into your piece before closing it up. Batting is also available in wool and polyester. Wool is preferable for appearance , loft and ecological reasons. I find with synthetic batting I usually have to cut to or three of my filling shape versus 1 in the wool. You won’t need much batting since a little goes a really long way. Batting is usually sold in lengths and widths matching standard mattress sizes since it is used to make quilts. If you plan on only making felt food a crib size batting will be more than enough. Foam fits in where batting leaves off it’s great for flat high things which are sometimes hard to get to hold a shape like cakes, tarts, pies, sticks of butter etc etc… The taller the item the more likely it is to be distorted when stuffed with regular stuffing. By foam I mean foam rubber the kind used to make chair pads and dog beds not Styrofoam which is entirely different and should never be used to make felt foods. When using foam you can either buy pre-cut shapes or buy foam by the yard and cut it to shape. The thicker the foam the more expensive it is. I find that you want no more than 3 inches tall for cakes, 2 inches or less for pies and ½ inch or less for bread slices, although when you are working with something thin batting should work as well or better than foam. If you can’t find the size you want you can attempt to glue to foam rounds together to achieve more height this is much harder to do than you would think, in order to accomplish you will need to acquire foam and fabric adhesive, this is a spray glue sold at upholstery shops and at some hardware stores. If you attempt to glue the foam any other way it will melt, shift or break apart under stress. I would recommend using stuffing before I would recommend gluing foam. We sell pre-cut foam rounds in many sizes and shapes for your felt food projects, all of our foam is pre-cut as well as being fire retardant. Selection of foam rounds from American Felt and Craft. Should you decide to cut your own you may be asking yourself how the heck you’re going to cut the foam. If your foam is very thin you may be able to use scissors otherwise you will need an electrical carving knife so it’s worth it to buy a good one. PLEASE PLEASE DO NOT ATTEMPT TO USE A HOT FOAM CUTTING WIRE, these are used to cut Styrofoam which heats and cools quickly if you attempt to cut a foam pad with this it will create a black smoke which is dangerous to breathe in and may cause the foam to melt and adhere to your skin causing terrible burns!! Please note your cuts do not have to be completely even or perfect when covered with felt lumps, bumps and unevenness tend to completely disappear. You might also want to add a bit of rice, un-popped popcorn kernels, doll beads, or beans to the bottom of some of your felt food it will help it to stand nicely. The food items can get a little questionable over time so if your in this for posterity I would use doll beads. Depending on the age of the kids your making the felt food for you may want to consider placing a rattle or squeaker inside your felt food. American Felt and Craft sells rattle inserts in 2 sizes, jingle ball inserts and squeaker inserts in 3 sizes. When making felt food for a family with children in multiple age ranges this is especially nice since the smaller ones will get just as much enjoyment from them as older more culinary minded siblings. 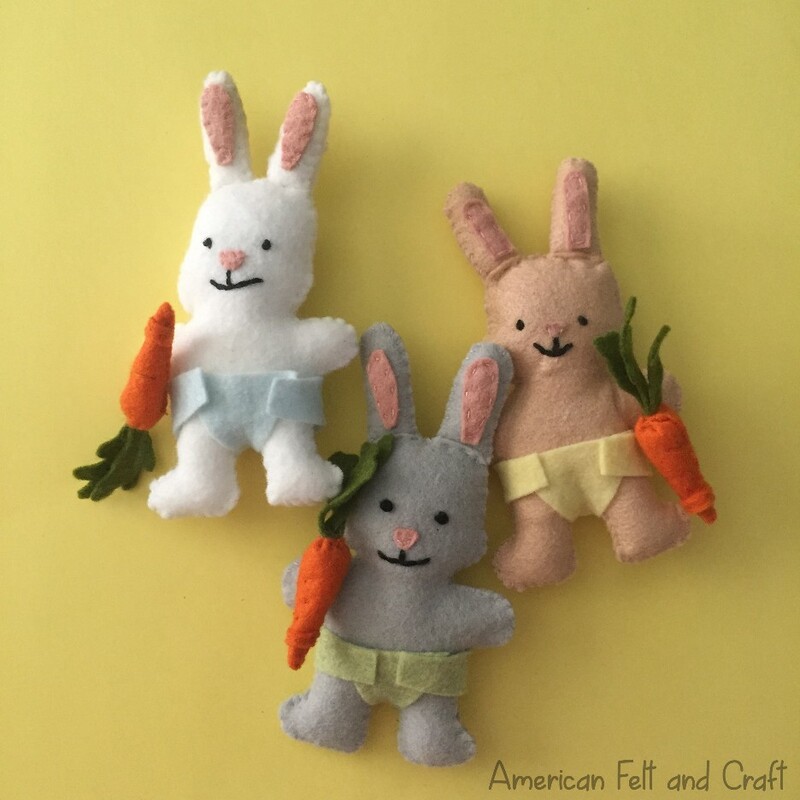 How to wash felt, wool felt foods, soft sculpture & toys.